Vaughan Bell reviews the new Tom Stoppard play at the National Theatre. 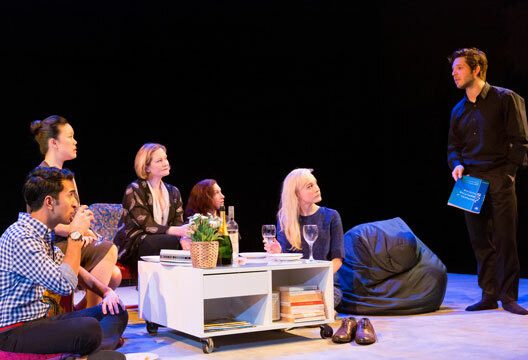 In the first scene of Tom Stoppard’s new play The Hard Problem, the charming but arrogant neuroscientist is arguing with Hilary, a psychology student about evolutionary biology. 'Altruism is always self-interest,' says Spike, 'it just needs a little working out'. In a single line, Spike captures the dilemma at the centre of Stoppard’s latest work: whether pure altruism really exists and what we can understand about human nature in its light. This thread glitters through the centre of the work and is the source of much of the dramatic tension, not least as Hilary is brilliantly portrayed by Olivia Vinall, whose confident uncomplicated performance stands out amid a consistently strong cast. The sharp setting and candid performances are certainly enjoyable but the golden thread is often lost amid layers of sometimes tangential and ultimately unnecessary neuroscience. We meet Hilary as a student but most of the action happens when she is a post-doctoral researcher at the Krohl Institute for Brain Science – a privately funded vanity institution built by the condescending hedge-fund guru Jerry Krohl. The setting is key and Stoppard has clearly amassed an impressively wide knowledge of both the practice and findings of modern cognitive science, but it’s also clear he never fully got to grips with its significance and, consequently, the play is somewhat awkward to the trained ear. This is a typical and often pedantic criticism of plays about technical subjects but in Stoppard’s case, the work is primarily about what defines us as human, in light of the science of human nature, and because of this, the material often comes off as clunky. It’s not that the descriptions are inaccurate – allusions to optogenetics, Gödel and the computability of consciousness, game theory, and cortisol studies of risk in poker players, are all in context – but Stoppard doesn’t really understand what implications these concept have for either each other or for his main contention. Questions about mind and body, consciousness and morality, are confused at times, and it’s not clear that Stoppard really understands the true implications of the Hard Problem of consciousness. But more frustrating is how the problem of human nature is pitched. The self-important Spike says anything non-scientific is 'gibberish', argues we’re just biology and therefore fundamentally self-centred. The good hearted Hilary questions evolution, doubts the scientific study of human nature, and thinks that not being able to explain consciousness is evidence for the existence of God. Underneath the scientific-sounding fireworks in the dialogue is a fundamentally pre-enlightenment view of human nature that equates mystery with moral virtue and suggests morality is necessarily mysterious. As a result, the cognitive science turns out to be a distraction, where misplaced talk of neuroscience actually obscures the central meaning. In this sense, the play is a lost opportunity to push ethical questions about human conduct up against the genuinely profound questions about the self raised by modern brain research. The one metaphor of the play that does work brilliantly is the Prisoner’s Dilemma – the classic paradigm in game theory where two criminals are caught and know that if they both keep quiet they’ll each get away with a light punishment, but if one rats and one stays silent, the rat goes free and the other goes down for a long stretch. Self-interest says you rat – you can’t risk trying to help another if it could send you into the abyss. Hilary baulks at the concept – not at the choices, but the assumptions. 'You’ve left out everything about Bob and me except we’re out for ourselves and we’ve got two buttons to push'. 'Actually,' she says sardonically, 'Bob loves me'. 'I’m confessing... I’m going to give Bob a chance to go straight.' Hilary’s reframing strikes at the core of how scientific models can sometimes simplify human nature into numerical dust and this is really where the play really hits its mark. At the end of the play, Hilary finds herself in her own version of the Prisoner’s Dilemma when a research assistant admits falsifying data for a study on morality that has both their names on it. The assistant declares she is motivated by love and wanted to impress. Hilary unmoved but compassionate, takes responsibility to save her junior, and loses her post. She saves a fraud in the hope of a better future. Her final act of humanity concerns her lost daughter, another important and touching story arc, but, if you’ll allow me my own moment of altruism, I won’t give it all away, for your own good, of course. There’s probably a brilliant play to be written about brain research, the Copenhagen of cognitive science perhaps, but Stoppard hasn’t managed it with The Hard Problem. He has, however, written an enjoyable work of theatre and he can always revise his ideas, we hope, based on the results of future experiments. - Dr Vaughan Bell is a Senior Clinical Lecturer at UCL, a clinical psychologist with South London and Maudsley NHS Foundation Trust, and blogger with Mind Hacks. The Hard Problem is currently running in the National Theatre. It will be broadcast to over 550 UK cinemas and many more world wide as part of National Theatre Live on 16th April. Well, at least Stoppard took a hammer to the overpraised permutations known as the Prisoner's Dilemma. New voices: Are we mindful of how we talk about mindfulness?